Educating Family Physicians in Palliative Care is funded by the Ministry of Health, Kingston Area Long-term Care Division. There is no registration fee, only a $100 deposit which will be returned when you complete the course. This program runs from Thursday - Sunday from 8:00AM to 5:30PM. Please see the sample agenda from a previous session which outlines a typical schedule for the program. All topics will be addressed but the order may vary. Family physicians living within LHIN 9 (Central East) and LHIN 10 (South East) are eligible to participate in the program. You may claim up to a maximum of $600 for expenses related to attending this course, such as travel, accommodation and the cost of a locum to cover your practice. If you are a rural physician, you may be eligible for additional funds from the OMA (to which you must apply directly) to offset additional expenses. 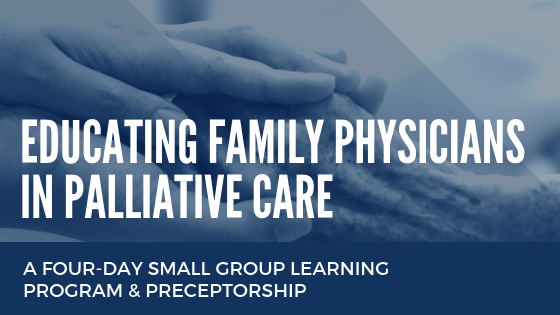 This Group Learning program meets the certification criteria of the College of Family Physicians of Canada and has been certified by Queen's University for up to 79.5 Mainpro+ credits. In an effort to switch to a “less paper” program, presentations will be available online under the program in your Program Centre account rather than being printed. Debora Stark, MSW, RSW Social Worker, Oncology and Palliative Care, Cancer Centre of SE Ont. at K.G.H.